So you're looking for more places to get your website listed? There are thousands of them out there, but finding those truly relevant sites that can help bring traffic and possibly impact your rankings in the search engines usually takes work. Now sweetiQ offers you a way to accomplish this in less than a week. 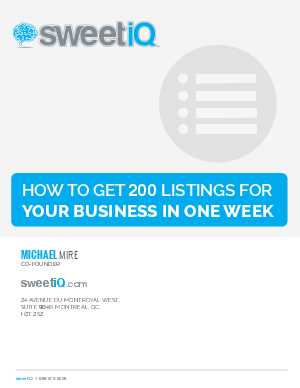 Seeing 200 new listings is entirely possible if you're willing to spend hours scouring the web for appropriate placements. In this document, you'll find that sweetiQ has done all of the heavy lifting for you: breaking out listing locations by industry. Download the paper to learn more about how you can get access to these listings and ensure that your information is accurate.